LONG BEACH, Calif.--(BUSINESS WIRE)--Advanced Environmental Group, LLC’s (“AEG”) Advanced Maritime Emission Control System (“AMECS”) has received California Air Resource Board (“CARB”) approval via an Executive Order (“EO”). The EO permits use of AMECS as an alternative to shore side power (cold ironing) for the marine shipping industry. AMECS is an innovation that reduces port pollution by capturing and eliminating the most harmful components from exhaust emissions of large oceangoing vessels, providing cleaner air for ports and surrounding communities. Current AMECS technology targets reduction of stationary ship exhaust emissions. Even with the shutdown of propulsion engines, stationary ships’ daily auxiliary diesel exhaust emissions are approximately equivalent to the daily emissions of more than 12,500 automobiles, which AMECS reduces to near zero. AMECS is approved for simultaneous emission capture from two exhaust stacks of a single ship, with independently verified test results proving 90% to 99% reduction of the particulate matter (PM), nitrous oxides (NOx), and sulfur dioxides (SO2) found in diesel exhaust. The AMECS solution represents an attractive alternative to the current method (shore power) for reducing ship-based emissions. AMECS offers maximum flexibility to manage global fleets, operational efficiency for ships to deploy and connect, and certainty of CARB-mandated emission reductions - all while remaining cost-effective. No ship and shore-side infrastructure investments are required. It also eliminates port and marine terminal operator concerns over power pricing and availability. 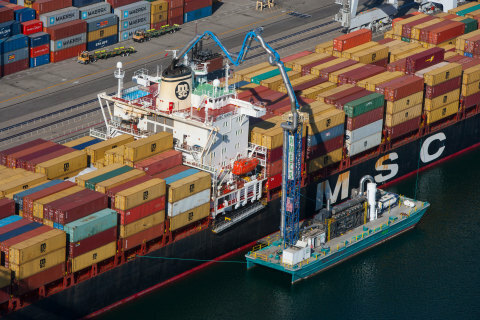 “CARB’s approval of AMECS as an alternative to the at-berth emissions reductions rule provides the flexibility our shipping lines need while protecting our environment and creating new jobs for our communities,” stated representatives from the Port of Long Beach, a strong supporter of AMECS throughout its development. For further information contact AEG’s President Ruben Garcia at (310) 763-1423, or email at rubeng@aegtechnology.com.